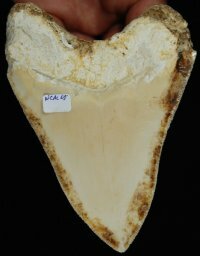 Rare, Quality New Caledonia Megalodon Shark Tooth [NEWCAL05] : Fossils Online, Welcome! Very nice, natural meg from New Caledonia. This is what they look like when they are not polished. Most of what you see on the internet are polished and in very poor condition. 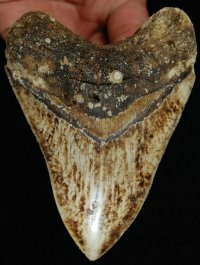 The root is a little eroded, but most of the bourlette intact which is a rarity on these teeth. The serrations are sharp...very sharp, which is very uncommon for these teeth. The non display side was covered in matrix which is why it is not stained. Dredging is now prohibited, so these will become even more difficult to obtain in any condition. In my haste to leave the shop, I forgot to upload the rest of the pictures. I'll add them in the morning. Sorry.